Is it possible that we have history all wrong? That the dates that conventional history is giving us regarding mankind are all incorrect? That humans lived on Earth much sooner that science originally thought so? With all of the recent discoveries that are being made, it certainly seems like a possibility. A Possibility that mainstream scholars seem to have a problem with, since that would mean our history book would need to be rewritten? The origin of man and the fundamentals of religions would change a lot, and that is something that mainstream scholars cannot possibly deal with. At first this footprint might not seem like much, as you can probably come across it anywhere on Earth, but this is no ordinary footprint. You can obviously see the anatomy of it, it resembles a modern-day human foot, but the thing is, this footprint is fossilized and embedded into a stone that researchers believe is at around 290 million years old. That is a gigantic missing period of time that if proven to be accurate will change a lot of things in society as we know it today. The discovery of the 290 million year old footprint was made in New Mexico by paleontologist Jerry MacDonald in 1987. In the vicinity of this mysterious footprint there are fossilized impressions of birds and other animals. The discovery of the human impression has left MacDonald particularly puzzled and not he or anyone who has seen and studied the impression has not been able to explain how this modern footprint could have been located in the Permian strata, which according to scholars dates from 290 to 248 million years, a time period which occurred long before man or even birds and dinosaurs existed on this planet, of course, that is according to modern science and scientific thinking. In this image we see a similar footprint dating back millions of years, the only difference is that this footprint is gigantic and located in Africa. Should we change the way we think and look at things? Or should we accept modern-day scientific thinking which suggests, there is no way that is a human footprint dating back 290 millions of years. It seems to be an ongoing debate between people who firmly believe that history is wrong, and those who point out that all of these mysterious findings are actually a hoax and have nothing to do with reality. This 290 million year old footprint has been categorized by paleontologists as problematic as they do not seem to understand the way it got there, and better yet, who left it there. 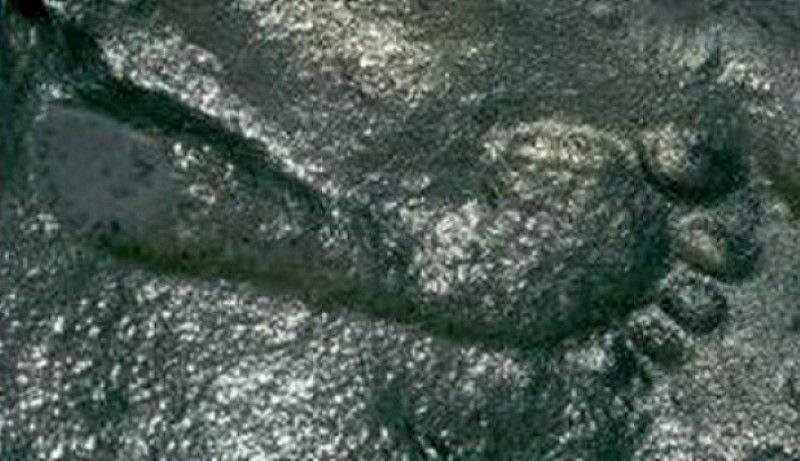 Basically some would say that to prove that this footprint which dates back 290 million years isn’t a fake, all we have to do is find something similar to it, and researchers have found numerous unexplainable things that can be connected with this footprint found in New Mexico. Researchers have had mixed feelings about this footprint, and they don’t seem to try very hard to debunk it, nor have they argued about the authenticity of the footprint. According to most researchers, they comment on the matter saying that ” It just looks like a human footprint”. Well, it doesn’t only look like one, it clearly is one.